Click on this link if you need more information about Wireless temperature sensor. The OM-CP-THERMALERT-GB and OM-CP-THERMALERT-P are temperature monitoring and alarming systems designed for use in hospitals, laboratories, pharmaceutical facilities and other critical temperature monitoring areas. Also, these units can be used to monitor a single temperature location or expanded to include hundreds of locations by adding additional transmitters. These units record both ambient temperature and humidity. The OM-CP-THERMALERT-GB and OM-CP-THERMALERT-P provides real time notification of temperature deviations, and features a user programmable alarm that can be configured to send a message via text message, screen alarm and/or e-mail if an alarm condition occurs. The OM-CP-THERMALERT-GB system includes an RTD probe that is mounted in a miniature bottle filled with ethylene glycol. In this method, a temperature “buffered” reading is taken, preventing false alarms. 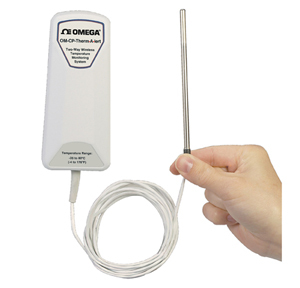 The OM-CP-THERMALERT-P system includes an RTD probe with a 90 cm long lead wire and a 115 mm long probe sheath. The OM-CP-THERMALERT-GB and OM-CP-THERMALERT-P system is equipped with wireless two-way communication. Full communication can be performed directly from a central PC, including starting, stopping and downloading. In addition to wireless transmission of data, both units store each reading to internal memory for backup. This back up data may be retrieved wirelessly at a later time. Customers can set-up automatic archiving preferences, ensuring all data is saved and retained to comply with federal regulations.